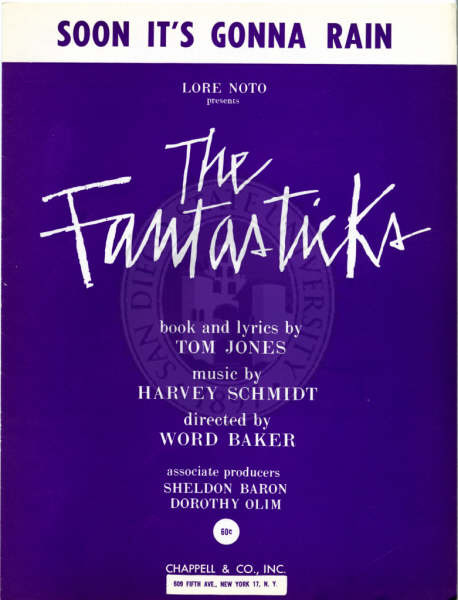 “Soon It’s Gonna Rain” is from the 1960 off-Broadway musical The Fantasticks, which ran for astounding 42 years and 17,162 performances at the Sullivan Street Playhouse. Soon it’s gonna rain. I can see it. Soon it’s gonna rain. I can tell. Soon it’s gonna rain. I can feel it. What’ll we do with you? We’ll find four limbs of a tree. We’ll build four walls and a floor. And duck inside to stay. Then we’ll let it rain. We’ll not feel it. Then we’ll let it rain, rain pell-mell. Soon It’s Gonna Rain was recorded on March 16, 1962 for On The Glory Road, which was to be released in 1962, but was canceled. The song was arranged by Ralph Sharon.